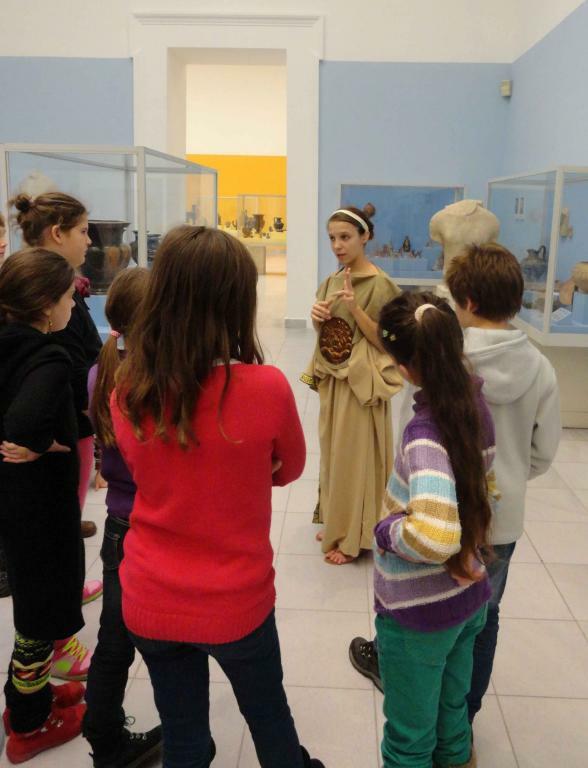 I work at the Museum of Fine Arts Budapest since 2001 at the Department of Classical Antiquities as a museum educator. I am also a drama teacher (trained by the Hungarian Drama and Theatre in Education Association in 2004). I took part in a workshop on interpreting in 2007 (organized by the Foundation for Museums and Visitors, Hungary, involving experts of Past Pleasures Ltd., UK). I have been on a study tour in the UK twice (2005, 2011). The second time I was an intern at Past Pleasures Ltd. Since 2008 at the Museum of Fine Arts I plan live interpretation sessions, assemble and prepare research material for the interpreters and train them. We do first person interpretation. Usually we play different ancient Greek and Roman characters for children groups, such as the Goddess Pallas Athene, a vase painter from ancient Athens, a slave girl from ancient Athens, and an ancient Roman sculptor. Rarely, on special occasions we perform a scene when an ancient Roman senator meets the wife of a Pannonian sculptor. Recently we developed three more characters from different periods, also for museum events of a larger scale: a Dutch woman from the XVII. century, a man from the XV. century Florence, and an ancient Egyptian tomb builder.